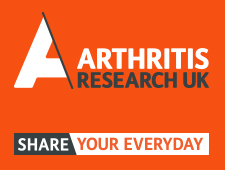 This week, Arthritis Research UK has launched their 'Share your Everyday' campaign. Running for six weeks across October and November, the charity are encouraging people to get involved by sharing their experiences of living with arthritis. They have created a dedicated sharing space for people with arthritis to not only tell their story, but also learn from others' experiences. Last year's campaign saw hundreds of people share teir everyday challenges, demonstrating how arthritis attacks what it means to live; from struggling to board a bus to the effect the weather has on their joints. Arthritis Research UK have since used this insight to guide their research, funding three new research projects focused on breaking through the daily pain that arthritis causes. This year, the charity is looking for even more people to get involved. The simple act of sharing your everyday experiences can shape the big ideas and little changes that will help to push back the limits of arthritis. Share your everyday experiences of living with arthritis to help Arthritis Research UK find your everyday freedom. Share your story here.